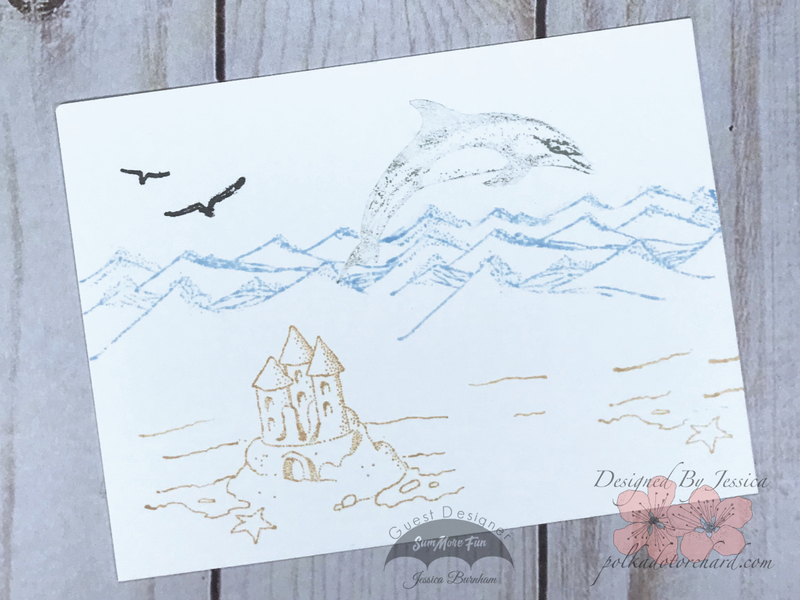 After I was done painting I decided to stamp and paint the sand castle and dolphin again. Except this time I fussy cut them out and used foam tape to pop them up off the original image on my stamped panel. I really like the 3D look it created. 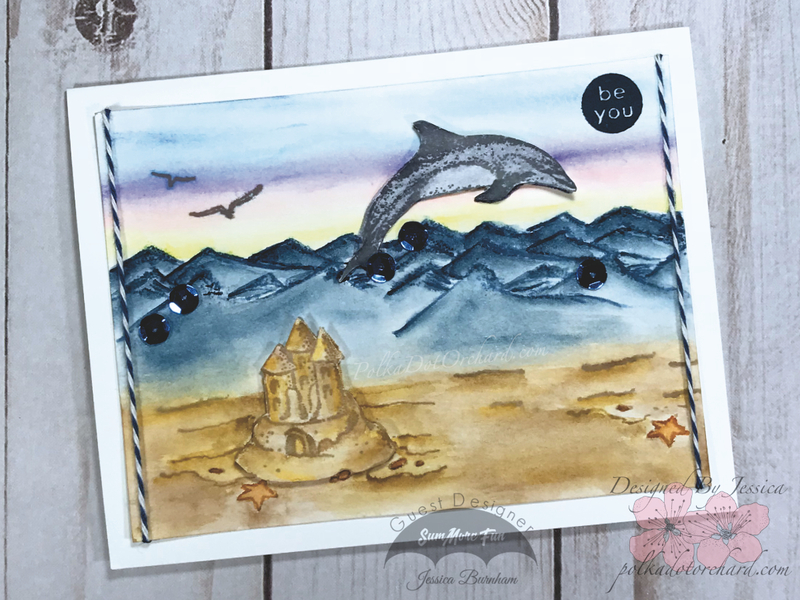 Before attaching this to my card base I stamped in the top corner “be you” In nautical blue Memento ink using a stamp from Risin Boat set called “Imagine“, and then wrapped some blue and white twine on the left and right side of my painted panel. Risin Boat is another wonderful line of stamps that SumMore Fun carries. After my painted panel was attached to my card base I felt it needed something more, which of course was a little bit of sequins. 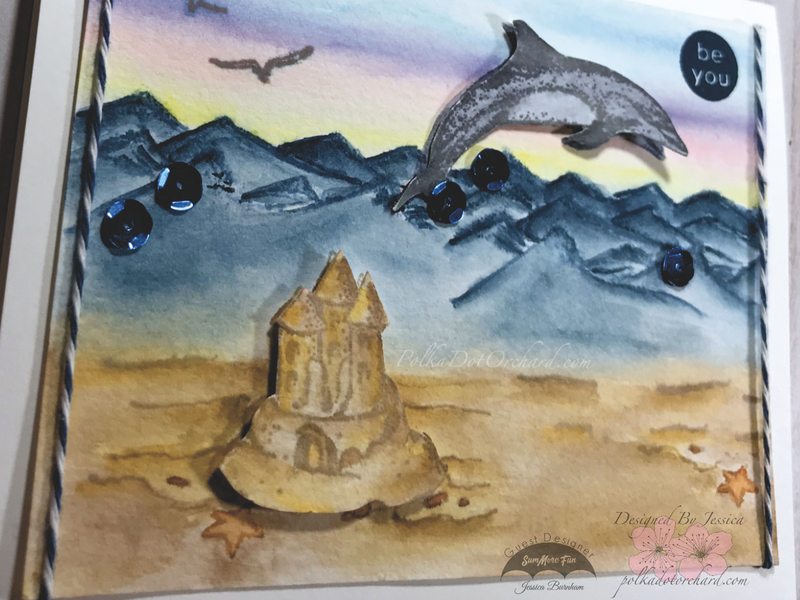 I decided to add blue sequins to the water which I felt was the perfect place to add it because the prettiest wasters are the ones that sparkle. No card is complete until the inside is done and I love making the inside match the front. I decided to keep the inside of this one simple by only matting white cardstock to the inside. 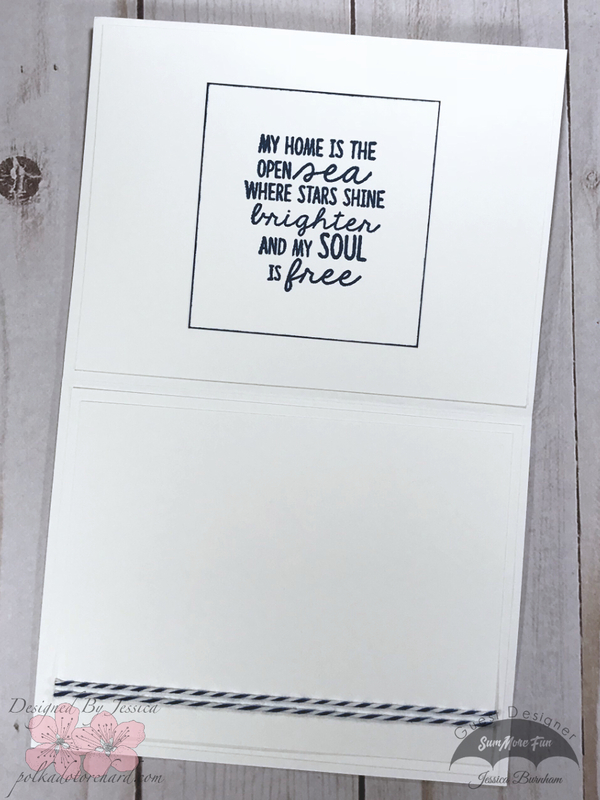 I found the perfect sentiment in my craft stash “MY HOME IS THE OPEN sea WHERE THE STARS SHINE brighter AND MY SOUL IS free”, which I stamped out in nautical blue Memento ink. I then trimmed down the edges close to the stamped sentiment, finishing it off by inking the edges of the cardstock and the same blue ink. For my final touch to the inside I added some blue and white twine to the area where the message to the recipient would be written. Sometimes I like laying out the inside of my cards this way, putting the sentiment on the back side of the card front and then leaving the entire inside blank. A layout like this is perfect for when you want to write long messages. Well, that’s it for today and I hope I have inspired you in some way. This is such a beautiful scene you created! I absolutely love it! Thank you for being guest designer this month at SumMore Fun. That turned out AMAZING! Your scene is Fantastic and I love the way you did the coloring…. The added Dimension looks so Cool too! 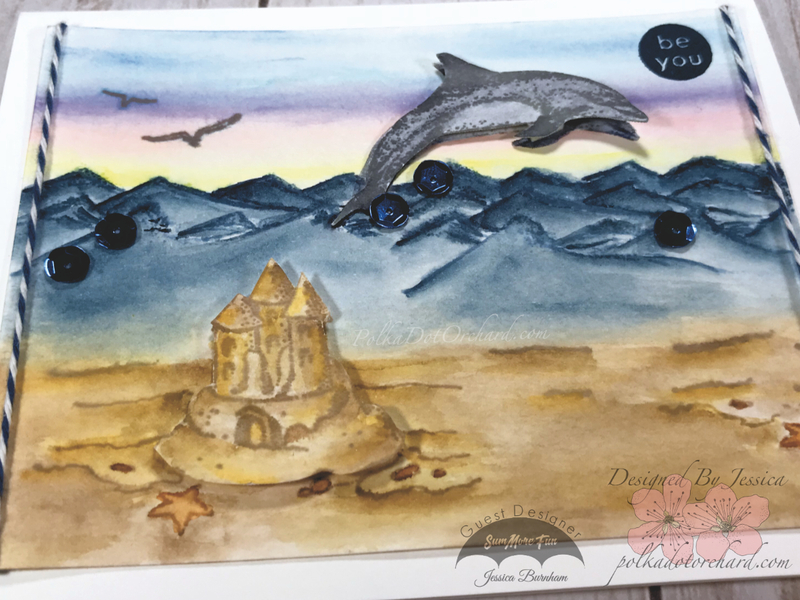 Thanks so much for being our Guest Designer this month – you really Nailed it! Have an Awesome weekend!